Director Martin Scorsese decided to return to mob crime drama once again after reading journalist Nicholas Pileggi’s Wiseguy, an 1986 non-fiction book depicting the day to day life of the New York mob scene. 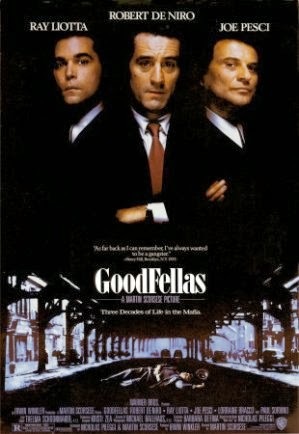 They collaborated on the film script, producing 12 drafts until they were happy with their joint efforts, and the resultant work was to become Goodfellas. The film narrates the story of real-life criminal Henry Hill (Ray Liotta) from his first encounters with gangsters as a teen, through to his exploits as a fully-fledged mobster up until 25 years later (though he never becomes part of ‘the family’, as he is half Irish). At no point are we encouraged to like him, sympathise with him, or in anyway hope for his success. Instead, I found myself deploring his actions more and more as the film progressed, and Scorsese himself expressed the wish that the audience would turn against him in anger. These men are cold, callous, and blind to the evil they commit; there is no room for empathy. Yet, more than anything, this film is engaging. Despite not having a single sympathetic character (except, perhaps, Hill’s abused wife Karen - the Oscar nominated Lorraine Bracco) Goodfellas is incredibly watchable. Scorsese uses quick cuts and similar editorial techniques, squashing scene lengths to maintain the pace. This keeps our interest piqued and our attention focused on what is happening on the screen; we have time to reflect later. Also, Hill’s friends, the psychopathic Tommy Devito (a character which gave Joe Pesci an Academy Award) and Jimmy Conway (Robert De Niro on typical form) might not be likeable guys, but they are charismatic. We want to know what happens to them, even if we don’t necessarily wish that to be good. They are at times humorous, always alarmingly intense, and frequently terrifyingly sociopathic in their total desensitisation to the violence they witness and commit. Goodfellas offers its viewers a well-conceived and (I’m told) realistic representation of the lives of New York mobsters from the 1950s through to the 80s. There are tensions, reprisals, and tithes to be paid, all of which pass in ever more shocking fashion. I did not stare horrified at the screen for the full 140 minutes, however. There is often cause to laugh, and my favourite scene was when Hill leaves the courtroom, acquitted, as a boy in his late teens (played by Christopher Serrone), welcomed with open arms and great shouts of joy by a hall full of his mob associates and bosses, congratulating him on his “graduation”, his first appearance in court. It is on this day he learns his most important lesson, ‘never rat on your friends, and always keep your mouth shut’.